When I was very young I traveled to a lot of temples. As I trotted the different religious structures, the animals there would always intrigue me. Elephants were among the most interesting, looking at these huge creatures always made me wonder why don’t they simply run away from their captors? The chains that held them were often very weak and old, it wouldn’t have taken much to break away from those shackles. I learned years later that young elephants are tied to similar chains and because of they are relatively smaller they cannot break the chains and escape. The young elephant keeps trying until it finally gives up assuming the chains are unbreakable. Its this realization that prevents them from breaking the weak chains once they are huge. Its ironic that we too as humans are tied with invisible chains when we are younger… We are told many times that certain things are beyond us and repetitively punished for thinking otherwise, until the day of giving up finally arrives… I once told a friend that sometimes to do something seemingly impossible the only thing we need to do is to outsmart our brain into believing its possible. This picture was taken just outside the beautiful Brihadeeswarar Temple at Thanjavur in Tamil Nadu, India. 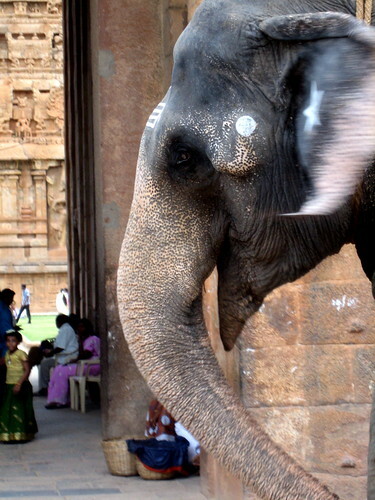 This entry was posted in Philosophy, Photo and tagged asia, Brihadeeswarar Temple, elephant, india, photography, Tamil Nadu, Thanjavur, Travels, Trip. Bookmark the permalink.